FINAL TEXT: Deal Physical damage to target enemy with a 65% chance to attack again. Inflict Accuracy Down on target enemy for 2 turns. 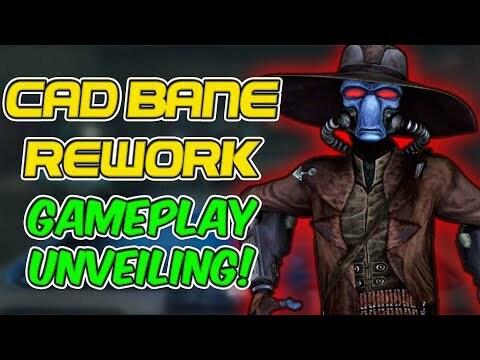 Cad Bane gains 15% Turn Meter for each Critical Hit. FINAL TEXT: Deal Physical damage to target enemy, dispel all buffs on them and Stun them for 1 turn. In addition, remove 50% Turn Meter, doubled against Jedi enemies. If the target is debuffed, remove 25% of their Max Protection (stacking). This attack can't be Evaded. 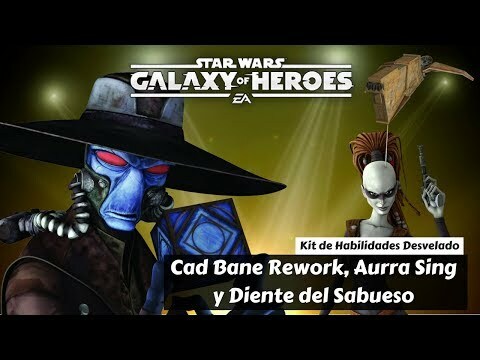 FINAL TEXT: Cad Bane has +30% Critical Chance and +30% Critical Damage. When Cad Bane inflicts a debuff, he recovers 5% Max Health and 5% Max Protection. When Cad Bane scores a Critical Hit, he has a 50% chance to reduce his cooldowns by 1. Reward: All enemies have -50% Tenacity for rest of the battle. All Bounty Hunter allies have their Payouts activated. Payout: Cad Bane has +25% Evasion. Inflict Thermal Detonator for 2 turns on attacking enemy when Cad Bane Evades, which can't be Evaded. Poor cad. At least they touched em up. Yeah this looks like a garbage rework. Cad stays on the bench. Maybe something there with his stuns and Tm removal. Kind of like a loop until everyone is stunned. Maybe. I was hoping he’d be better. Dang, I would have loved his previous leader ability with his new kit. Evasion unique plus evasion lead plus accuracy down would have been fun. Hmmmmm....not sure if this makes him better. He looks fun against Bastilla. Excessive potency, dispell, tenacity down for enemies. Seems to counter the Bast zeta. He's a little bit better but not the best Bounty Hunter in SWGOH. A team with Aurra Sing is just OK. There's a rumour that Latts Razzi will be released on August 30th 2018. Doesn't look great, but he'll be better than he was. Can Zam Wessel please get a contract added to her kit, now? She doesn't even need a rework, but being the lone BH without the contract mechanic is kinda odd. Have had him at gear 11 for quite and looks like he will stay there. Hopefully I am wrong. Lived Anhalds video commentary, basically asking himself the whole way through as to why he is even using him. I'm very disappointed. Oh well. I still have my health. Not against Treya. Debuffs don't stick. Also not against Treya because she has huge crit avoidance as part of her lead. Way less cool down decreases. And not against Bastilla. Her tenacity is too high, and he can't get his contract that lowers her tenacity without sticking debuffs... which he can't do because her tenacity is too high. His extra potency wasn't enough in Ahnald's vid. Also not against Bastilla because her whole team will lap him. He's slow as dirt, and they start with a significant TM boost. Also disappointing is that his damage didn't appear to be increased in any meaningful way. He's better, but still lackluster on a good day. Oh well. Maybe he'll get reworked again in a few years. Sad they got rid of the evasion lead and tm to everyone on evade. Been using him in GW, and IG-88 was able to take out a target locked Zylo on his own. Seems like he'll be a hard counter to Bastilla teams. So some BH can have over 160% potency under him. How high does it need to be to overcome Bastila? Regardless he will be ok under an Embo or Boba lead. Unevadable stun that can reset often might be good. At least he is somewhat viable now. Edit: Just looked at Aurra. Could make a stun team under a Cad lead now? Not sure how useful that is, but could be done. Ig88, vandor, cad, l3, nest. That's the only line up I can see him working well in. Well I'm happy he got a rework. He isn't the game changing meta Bounty Hunter people wanted but I'm still pumped to use him more! I just hope that @CG_Leviathan or someone on the team picks up on the forums and from videos that he needs a speed boost in a serious way. Not a big change to make to his current rework. He's one of the slowest characters in the entire game?! Reminds me ppl saying vader and palp rework are trash, and they are everywhere now. Are they serious? We're taking about CAD BANE. The blue ex smoker from the anti cigarette commercials who took on two jedi masters at the same time, and came out a free alien. He freaking trained boba fett. 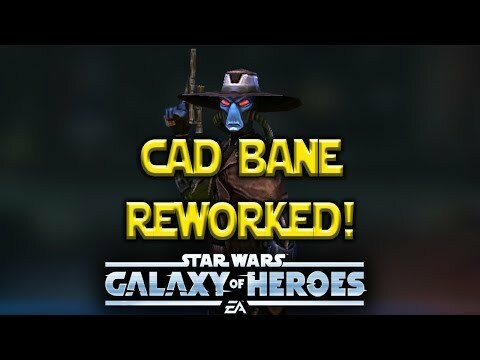 Do the devs know who Cad Bane is? He's more powerful than any of the stupid bounty hunters they have in the game. This is disappointing. #notmycadbane Lately, I've been upset with many of their choices. Someone from my guild quit GOH today. As Bastilla only gives +150% tenacity, not only does 160% potency cancel it out, it gives a 10% boost to boot. Edit: Don't see your 160%, but he gives 100% potency and removes 50% tenacity, which cancels out all of Bastila bonus.